President Moon Jae-in said Monday that he expects the second North Korea-U.S. summit will serve as a turning point to substantially and tangibly advance the goals of achieving complete denuclearization and a peace regime on the Korean Peninsula and forging new relations between Pyongyang and Washington. 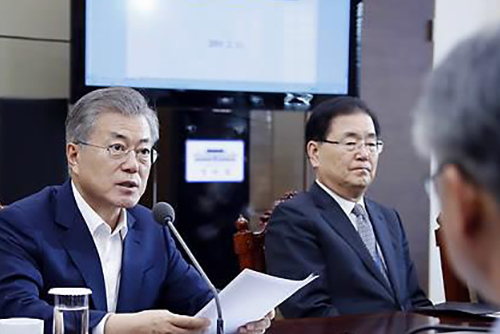 Moon told top aides Monday the upcoming meeting can also present a critical opportunity to further develop inter-Korean relations to the next level. He said seizing this opportunity, the first of its kind since the division of the Korean Peninsula, is the way to build a future completely free of the threat of war. President Moon said that speculation still lingers on whether the denuclearization and peace process on the peninsula is moving forward, adding some people actually appear to favor the continuation of an era of hostility and conflict. Moon said the leaders of the two Koreas and the United States are taking this path unwaveringly because they have strong faith in the direction toward which history should progress. Moon expressed respect for President Donald Trump and North Korean leader Kim Jong-un's determination, saying they are crossing over the "sea of distrust" that continued for seven decades through their bold diplomatic efforts. The second North Korea-U.S. summit is scheduled at the end of this month in Hanoi, Vietnam.